By Keith Cowing on July 31, 2018 5:43 PM. By Keith Cowing on July 31, 2018 4:10 PM. "American Space Exploration & Commercialization - Research and innovation in space have a direct impact on Earth, generating advancements in our basic understanding of the universe and our own planet, and inspiring the next generation of scientists and engineers. Research investments should be focused on ensuring American leadership in space for long-duration spaceflight, in-space manufacturing, in-situ resource utilization, longterm cryogenic fuel storage and management, and advanced space-related power and propulsion capabilities. Agencies should prioritize demonstrations and flight tests to ensure an industrial base for commercial activity in space and on celestial bodies. One area of potential scientific and commercial importance is microgravity-related research that has the potential for near-term breakthroughs in biopharmaceuticals and materials science. Finally, agencies should seek opportunities to work with advanced materials, additive manufacturing, optical communications, and machine learning-capabilities that have broad potential applications in space and on Earth." Pluto Huggers Are Upset By The Use Of The Term "Planet 9"
By Keith Cowing on July 31, 2018 2:52 PM. "ON THE INSENSITIVE USE OF THE TERM "PLANET 9" FOR OBJECTS BEYOND PLUTO: We the undersigned wish to remind our colleagues that the IAU planet definition adopted in 2006 has been controversial and is far from universally accepted. Given this, and given the incredible accomplishment of the discovery of Pluto, the harbinger of the solar system's third zone - the Kuiper Belt - by planetary astronomer Clyde W. Tombaugh in 1930, we the undersigned believe the use of the term "Planet 9" for objects beyond Pluto is insensitive to Professor Tombaugh's legacy. We further believe the use of this term should be discontinued in favor of culturally and taxonomically neutral terms for such planets, such as Planet X, Planet Next, or Giant Planet Five." Continue reading Pluto Huggers Are Upset By The Use Of The Term "Planet 9". By Keith Cowing on July 30, 2018 8:48 PM. "U.S. Sens. Ted Cruz (R-Texas), Bill Nelson (D-Fla.), and Ed Markey (D-Mass. ), members of the U.S. Senate Committee on Commerce, Science, and Transportation, on Wednesday introduced the Space Frontier Act (S. 3277). This commercial space bill builds upon the 2015 Commercial Space Launch Competitiveness Act by streamlining and reforming the regulatory framework for commercial space launch and Earth observation operations, which is crucial to maintaining American leadership in space. The bill also extends the operation and utilization of the International Space Station (ISS) through 2030 to ensure that the U.S. is getting the maximum return on American taxpayer investment to avoid creating a leadership vacuum in low Earth orbit." Keith's note: Contain your enthusiasm, space fans. This grab bag of ideas does not actually fund itself. It may well make it easier for space commerce to proceed with various commercial ventures by cutting some red tape. But in terms of the things this bill wants NASA to pay for (like ISS through 2030) this legislation just says that its OK to spend money on these things. Actually spending money to do these things is another matter entirely and is up to appropriators to argue about annually for the next 12 years or so. How NASA will be assured of the funding needed to fund ISS through 2030 while doing the whole Moon/Mars thing has yet to be addressed. Oh yes - what about Space Force? By Keith Cowing on July 30, 2018 12:42 PM. "NASA uses 76.6 percent of the Station's research resources, so it pays 76.6 percent of the U.S. Segment's operating costs. Although a significant portion of total Station research time, the NASA Authorization Act of 2010 requires at least 50 percent of these resources, including upmass and crew time, be allocated to the CASIS-managed National Laboratory, limiting the time and capabilities available to NASA for mitigating risks associated with future space exploration goals. While our prior work found that CASIS has used on average only 52.7 percent of the crew time allocated from September 2013 to April 2017, its use of crew time has increased since 2016 to 72.8 percent between March 2016 and September 2016 and 68.1 percent between September 2016 and April 2017.39 Any allocation unused by CASIS can be used by NASA for its own research." "CASIS will be allocated additional research hours when NASA adds an additional crew member to the Station in late 2018. However, given its performance to date, CASIS utilization rates for the National Lab will likely further diminish." By Keith Cowing on July 30, 2018 12:01 PM. "Specifically, we question whether a sufficient business case exists under which private companies will be able to develop a self-sustaining and profit-making business independent of significant Federal funding within the next 6 years. Likewise, any extension of the ISS past 2024 would require continued funding in the neighborhood of $3-$4 billion annually to operate and maintain the Station - a significant portion of which could otherwise be redirected to develop systems needed for NASA's cislunar or deep space ambitions. In addition, extending the Station's life would challenge NASA to manage the risks associated with continued operation of the Station's aging systems and infrastructure. Furthermore, any extension will require the support of NASA's international partners, whose continued participation hinges on issues ranging from geopolitics to differing space exploration goals." "By 2024, NASA will have invested $196 million in CASIS. In our opinion, weaknesses in performance measurement and the lack of an overall strategy have created an environment in which NASA continues to accept incremental improvement rather than more tangible attainment of agreed-upon goals. Consequently, without significant change, CASIS likely will fall short of advancing NASA's goal for a commercial economy in low Earth orbit. NASA needs to engage more substantively with CASIS and exercise more effective oversight of the cooperative agreement to clarify CASIS's role in helping build a robust economy in low Earth orbit." "Candidly, the scant commercial interest shown in the Station over its nearly 20 years of operation gives us pause about the Agency's current plan. This concern is illustrated by NASA's limited success in stimulating non-NASA activity aboard the Station through the Center for the Advancement of Science in Space, Inc. (CASIS). Established in 2011 to facilitate use of the ISS by commercial companies, academia, and other Government and non-Government actors for their research or commercial purposes, CASIS's efforts have fallen short of expectations." "Although CASIS awarded $21.7 million in grants to 140 projects between fiscal years (FY) 2013 and 2016, the organization has underperformed on tasks important to achieving NASA's goal of building a commercial space economy in low Earth orbit." By Keith Cowing on July 27, 2018 12:31 PM. 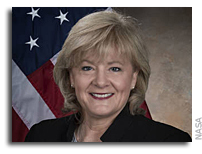 "NASA has named Jody Singer acting director of NASA's Marshall Space Flight Center in Huntsville, Alabama, as the agency seeks a permanent director. Todd May, who had served as Marshall director since February 2016, retired from the agency effective July 27, capping a 27-year career with NASA that began in 1991 as an engineer at Marshall." By Keith Cowing on July 26, 2018 4:38 PM. By Keith Cowing on July 26, 2018 1:45 PM. "In questioning, Smith asked whether Northrop Grumman had taken responsibility for the problems listed in the IRB report. "In Mr. Young's report there were several instances of preventable human error that were pinpointed that led to millions of dollars in cost overruns. I'm wondering if those employees are still employed by Northrop Grumman," Smith asked. Bush could not confirm that anyone had been fired as a result of the human errors that have delayed JWST. Smith asked if Northrop Grumman was planning to pay the $800 million in above-cap expenses, and the answer was also no. "I wish that Northrop Grumman would take responsibility and show a little bit more good faith both for the taxpayer and for the cost overruns," Smith said." Rep. Smith then hammers @NorthropGrumman CEO Wes Bush again and again and again what their profit was. Bush will not answer. Smith hammers him again about his refusal to publicly state NG profit. Bush continues to refuse. Smith then abruptly ends the hearing. Rep. Smith asks @northropgrumman CEO Wes Bush again and again and again if anyone lost their jobs due to human errors on #JWST. He eventually answers "none". Rep Beyer wants to put #JWST life cycle cost of $9.66 billion in perspective of @NASA budget. Says this is 1% of NASA's budget (huh?) Wes Bush says @NorthropGrumman ambitions were set higher due to astronomy discoveries and vision for mission expanded. OK, so Science is at fault? Smith says that he thinks that @NorthropGrumman should be willing to pay this $800 million #JWST cost itself and is not happy with Bush's response. Smith asks about $800 million in unplanned expenses and whether @NorthropGrumman will pay for that. Bush replies that this is a cost-plus contract and babbles. Smith asks again. Bush says that doing so would impede relationship with @NASA. By Keith Cowing on July 25, 2018 6:15 PM. "U.S. Sen. Ted Cruz (R-Texas), chairman of the Subcommittee on Space, Science, and Competitiveness, will convene a hearing titled "Destination Mars - Putting American Boots on the Surface of the Red Planet" at 2:15 p.m. on Wednesday, July 25, 2018. The hearing will focus on the National Aeronautics and Space Administration's (NASA) exploration priorities and will be the first in a series of hearings in anticipation of a future NASA authorization legislation." Continue reading Odd Hearings Ahead On Webb Space Telescope Problems (Update). By Keith Cowing on July 24, 2018 5:48 PM. "As many of you know, this Caucus was established last October and it has been working largely behind the scenes in anticipation of tonight's keynote speaker being confirmed: NASA Administrator Jim Bridenstine." By Keith Cowing on July 24, 2018 8:26 AM. 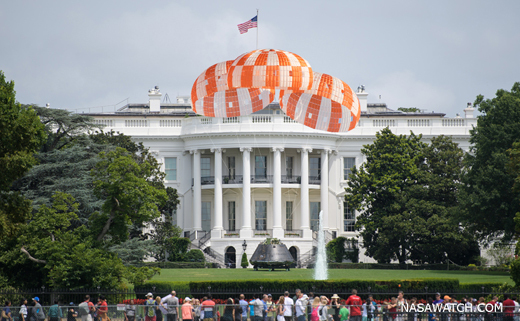 "NASA's Orion spacecraft that flew Exploration Flight Test-1 on Dec. 5, 2014 is seen on the South Lawn of the White House, Sunday, July 22, 2018 in Washington, DC. Lockheed Martin, NASA's prime contractor for Orion, began manufacturing the Orion crew module in 2011 and delivered it in July 2012 to NASA's Kennedy Space Center where final assembly, integration and testing was completed. More than 1,000 companies across the country manufactured or contributed elements to the spacecraft." "NASA's Orion spacecraft is built by Lockheed Martin; the SLS rocket is built by Boeing, Aerojet Rocketdyne and Northrop Grumman; and the rocket's Launch Platform/ Exploration Ground Systems is supported by Jacobs." By Keith Cowing on July 21, 2018 9:14 PM. "The company said it conducted a hot-fire test of the launch-abort engines on an integrated service module at the White Sands Test Facility in New Mexico in June. The engines successfully ignited and ran for the full duration, but during engine shutdown an anomaly occurred that resulted in a propellant leak. "We have been conducting a thorough investigation with assistance from our NASA and industry partners," the statement said. "We are confident we found the cause and are moving forward with corrective action. Flight safety and risk mitigation are why we conduct such rigorous testing, and anomalies are a natural part of any test program." By Keith Cowing on July 18, 2018 7:39 PM. "Another slide from [CNSA's Pei Zhaoyu] offered some thoughts on the gateway concept, which NASA intends to build out during the 2020s, delaying a human landing on the Moon until the end of the decade at the earliest. Pei does not appear to be certain about the scientific objectives of such a station, and the deputy director concludes that, from a cost-benefit standpoint, the gateway would have "lost cost-effectiveness." Big Announcement at KSC With Pence? By Keith Cowing on July 18, 2018 7:37 PM. 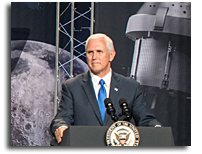 "Vice President Mike Pence will visit NASA's Kennedy Space Center in Cape Canaveral next month to announce the first astronaut crews under NASA's Commercial Crew Program, according to sources familiar with the matter. Pence, who chairs the National Space Council, will confirm a new launch date for the first private crew missions and announce which crew capsules each of the four selected astronauts will ride in to the International Space Station." By Keith Cowing on July 18, 2018 6:48 PM. "Jim Bridenstine, who was appointed as NASA's administrator by US president Donald Trump earlier this year, said the UK government's plans for new spaceports open new opportunities. "We are thrilled about this. "It's about what we are trying to launch, where do we want it to go in orbit and who can provide the best price. "The UK and the US have a long partnership in space exploration," he added. "I would see NASA putting satellites on top of a rocket that launches from the UK," he said." By Keith Cowing on July 18, 2018 11:15 AM. Keith's note: Flawless 9th flight for BlueOrigin. If only airlines operated like this. Watch a replay. More Flying Rich People Will Soon Fly Into Space. Yawn. By Keith Cowing on July 18, 2018 9:41 AM. Just an FYI per earlier posts I have done ZeroG training - twice and #NASTAR suborbital scientist training flying full-g simulations in their centrifuge. Anyone in good health can fly into space. By Keith Cowing on July 17, 2018 11:29 PM. Keith's note: Northrop Grumman has a big Webb Space Telescope Charm offense underway. Their ads are everywhere. 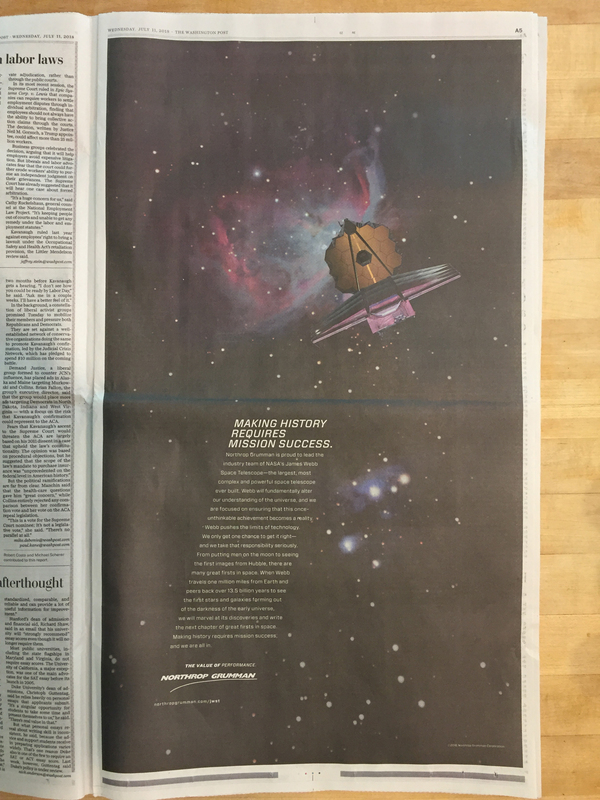 First they took out that huge $200,000 full page ad in the Washington Post. Now they have a companion website using this code under ad links that pop up all over the place: http://www.northropgrumman.com/MediaResources/MediaKits/JWST/Home.aspx?utm_source=PrintAd&utm_medium=Redirect&utm_campaign=FromOrigJWSTurl+Redirect When you get to the website you are treated to nothing but happy aerospace banter. No mention of launch dates and delays, more than a decade of multi-billion dollar cost overruns, the need for Congressional reauthorization due to cost overruns, anger by NASA managers, dumb engineering mistakes, etc. 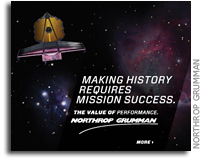 Instead, NorthropGrumman just pounds out their oxymoronic tag line "Making History Requires Mission SUccess". "Northrop Grumman just wants you to know that "mission success" is important. Duh. I am not certain they care so long as they get paid. This is not how America is going to do that whole leadership-in-space thing. If this is an example of how we do that leadership thing we won't be able to afford to lead the way." By Keith Cowing on July 16, 2018 9:49 PM. Yea but @NASA won't be using this reusable Ar-22 engine. @DARPA will use it on Phantom Express. By Keith Cowing on July 16, 2018 10:26 AM. "Loren Thompson, a defense consultant who works for the Lexington Institute, a think tank that gets funding from defense contractors, said he is worried the military will be unable to buy next-generation weapons systems if it spends too much on overpriced spare parts." "Loren Thompson, a defense consultant, said that when Warden was elevated to the COO position last year, "it was a signal that succession had begun." .. Thompson called Bush "a godsend for Northrop Grumman shareholders. Nobody in the industry believed when he became CEO that the share price would have get as high as it is today. In fact, the company was in such bad shape when Wes took over that his predecessor had to fight to get him the job." "The 501(c)(3) Lexington Institute doesn't disclose its donors. But Thompson said it receives contributions from defense giants Lockheed Martin, Boeing, Northrop Grumman and others, which pay Lexington to "comment on defense." Keith's note: It is rather odd that the Washington Post does not bother to tell its readers that Loren Thompson's employer, the Lexington Institute, gets significant funding from Boeing, Lockheed Martin, Northrop Grumman and other defense companies - especially when he is being quoted in articles about those companies. Yet the post goes out of its way (quite properly) to tell people that Jeff Bezos owns the Washington Post every time Amazon, Whole Foods, or Blue Origin are mentioned in a story. By Keith Cowing on July 15, 2018 6:37 PM. Planetary Exploration Newsletter: "Brad Smith was a pioneer in the exploration of the solar system. He participated in a number of US and international space missions, including Mars Mariners 6 and 7, the Mars Viking mission, the Soviet Vega mission to Halley's Comet, the Soviet Phobos mission to Mars, and the Wide Field/Planetary Camera team for the Hubble Space Telescope. He was the deputy team leader of the imaging team on the Mariner 9 Mars Orbiter, and was chosen by NASA to lead the camera team on the Voyager missions to Jupiter, Saturn, Uranus, and Neptune. He co-discovered a circumstellar disk around the nearby star, Beta Pictoris, the first direct evidence of a planetary system beyond our own, and continued these studies as a member of the infrared camera (NICMOS) experiment on the Hubble Space Telescope. For the full obituary and memorial service information, go to: http://shorelips.net/bradsmith The memorial service for Brad will be held from 2 to 5 PM on Saturday, September 22, 2018 at the Lunar and Planetary Laboratory, Room 308, at the University of Arizona in Tucson. Please RSVP to Amy Phillips (amy_p -at - mac.com). More information will be posted at the above site as it becomes available." By Keith Cowing on July 14, 2018 12:34 PM. "NASA Administrator Jim Bridenstine met Thursday with Israel's Science and Technology minister, Ofir Akunis, and they agreed to expand cooperation on issues including the international space station, space exploration, and earth science research, the Hebrew media Ynet website reported. Akunis expressed interest in sending a second Israeli astronaut into space and Bridenstine said the United States would consider the request, Haaretz newspaper reported." From the an event held on the one year anniversary of Columbia's loss at the Israeli embassy in Washington, DC: "At the end of the event, Rona Ramon, Ilan's widow, spoke last. "Our mission in space is not over" she told the hushed audience. "He was the first Israeli in space -- that means there will be more." By Keith Cowing on July 13, 2018 12:08 PM. By Keith Cowing on July 12, 2018 5:18 PM. From NASA PAO: "The following is a statement from NASA Administrator Jim Bridenstine on Thursday's announcement of the intended nomination by President Donald Trump of James Morhard to serve as the agency's deputy administrator: "Today the President announced his intent to nominate James Morhard as Deputy Administrator of NASA. "Morhard is the United States Senate Deputy Sergeant at Arms. Prior to this, he was the Staff Director of the Senate Appropriations Committee. During his tenure there, he ran the Senate Commerce, Justice, State subcommittee that included all NOAA programs, and the Military Construction subcommittee where public/private partnerships were first used for military housing. "This administration is committed to American leadership in space, and I look forward to working with Mr. Morhard upon his confirmation." Continue reading NASA Deputy Administrator Nominee Is James Morhard. By Keith Cowing on July 11, 2018 12:33 PM. 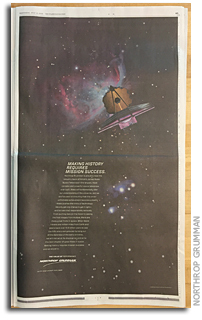 Keith's note: The following full page color advertisement by Northrop Grumman appears on page A5 of today's Washington Post (larger image). "MAKING HISTORY REQUIRES MISSION SUCCESS. Northrop Grumman is proud to lead the industry team of NASA's James Webb Space Telescope - the largest, most complex and powerful space telescope ever built. Webb will fundamentally alter our understanding of the universe, and we are focused on ensuring that this once-unthinkable achievement becomes a reality. Webb pushes the limits of technology. We only get one chance to get it right - and we take that responsibility seriously. From putting men on the moon to seeing he first images from Hubble, there are many great firsts in space. When Webb travels one million miles from Earth and peers back over 13.5 billion years to see the first stars and galaxies forming out of the darkness of the early universe, we will marvel at its discoveries and write the next chapter of great firsts in space. Making history requires mission success and we are all in." Yea, Northrop Grumman is "all in" on this. Non-stop cost increases and schedule delays for 16 years have turned this project into a cash cow for the company. You bet they're "all in" - even if they can't seem to attach fasteners properly and don't read the instructions on what solvents to use to clean hardware. But that's OK since NASA will just keep paying those invoices. Advertisements like this in the Washington Post like this can easily cost between $100,000 to $200,000. At a minimum you'd hope that the money for ads (which should be spent on fixing Northrop Grumman's dumb mistakes) would at least be used for public commentary that is a little more honest about the situation. Instead, you see no mention of any of these screw ups or obscene cost increases - problems that are so bad that Congress now has to reauthorize this project. Northrop Grumman just wants you to know that "mission success" is important. Duh. I am not certain they care so long as they get paid. This is not how America is going to do that whole leadership-in-space thing. If this is an example of how we do that leadership thing we won't be able to afford to lead the way. "As a result of the delay, Webb's total lifecycle cost to support the March 202l launch date is estimated at $9.66 billion. The development cost estimate to support the new launch date is $8.8B (up from the $8B development cost estimate established in 2011)." "The James Webb Space Telescope is scheduled for launch in 2010 aboard an expendable launch vehicle. NASA today selected TRW, Redondo Beach, Calif. [Bought by Northrop Grumman 2 months earlier], to build a next-generation successor to the Hubble Space Telescope in honor of the man who led NASA in the early days of the fledgling aerospace agency. Under the terms of the contract valued at $824.8 million, TRW will design and fabricate the observatory's primary mirror and spacecraft. TRW also will be responsible for integrating the science instrument module into the spacecraft as well as performing the pre-flight testing and on-orbit checkout of the observatory." By Keith Cowing on July 11, 2018 11:42 AM. "Further delays are likely as the Commercial Crew Program's schedule risk analysis shows that the certification milestone is likely to slip. The analysis identifies a range for each contractor, with an earliest and latest possible completion date, as well as an average. The average certification date was December 2019 for Boeing and January 2020 for SpaceX, according to the program's April 2018 analysis. Since the Space Shuttle was retired in 2011, the United States has been relying on Russia to carry astronauts to and from the International Space Station (ISS). Additional delays could result in a gap in U.S. access to the space station as NASA has contracted for seats on the Russian Soyuz spacecraft only through November 2019. NASA is considering potential options, but it does not have a contingency plan for ensuring uninterrupted U.S. access. NASA's certification process addresses the safety of the contractors' crew transportation systems through several mechanisms, but there are factors that complicate the process. One of these factors is the loss of crew metric that was put in place to capture the probability of death or permanent disability to an astronaut. NASA has not identified a consistent approach for how to assess loss of crew. As a result, officials across NASA have multiple ways of assessing the metric that may yield different results. Consequently, the risk tolerance level that NASA is accepting with loss of crew varies based upon which entity is presenting the results of its assessment. Federal internal controls state that management should define risk tolerances so they are clear and measurable. Without a consistent approach for assessing the metric, the agency as a whole may not clearly capture or document its risk tolerance with respect to loss of crew." By Keith Cowing on July 10, 2018 10:19 PM. Keith's note: On 13 June 2018 NASA civil servant John Guidi, Deputy Director of the HEOMD Advanced Exploration Systems Division, participated in a FISO (Future In-Space Operations (FISO) Working Group) telecon. The title of his presentation was "NASA's Changing Human Spaceflight Exploration plans". That's certainly a topic of interest these days, yes? FISO telecons are run by NASA GSFC civil servant Harley Thronson and Dan Lester at the University of Texas. The PDF of the presentation is here https://fiso.spiritastro.net/telecon/Guidi_6-13-18/Guidi_6-13-18.pdf unless the link does not work. Then maybe you can try this link http://fiso.spiritastro.net/telecon/Guidi_6-13-18/ unless it does not work either. Or maybe you can cut and paste the URL directly into your browser. Or maybe you can use another Internet access method. Tweeting links is a waste of time since they block that too. This is the sort of games that Harley Thronson and Dan Lester play. The NASA civil servants who regular participate in these telecons do so as part of their official duties. Often times they release information at these FISO telecons that NASA has not officially released elsewhere. NASA PAO never announces these civil servant presentations as they regularly do for other conferences and workshops. So this all happens in semi-stealth mode - if Thronson and Lester let you know in advance or give you access to materials after the fact. If they do not like you then they block your IP address. So here we are with NASA pivoting back to the Moon again and a presentation by a senior NASA Headquarters representative about NASA's current plans for returning to the Moon is available to some taxpayers on a private website but not others on an official NASA website. Why isn't this stuff posted on NASA.gov? Yea, NASA has this whole messaging thing down, doesn't it? By Keith Cowing on July 10, 2018 1:05 PM. Janet Kavandi @JanetKavandi is still the odds-on favorite to be nominated to become @NASA Deputy Administrator and is the clear preferred choice of @JimBridenstine . As is always the case here in Washington lots of other names are bubbling up - some of whom are self-promoting. Dark Days Ahead For Russia's Space Program? By Keith Cowing on July 9, 2018 12:02 PM. "As soon as next year, the United States plans to stop paying hundreds of millions of dollars a year to Russia for Soyuz seats, because it is developing its own transport to the space station. And the European Space Agency has signaled that it will stop launching Russian Soyuz rockets from its French Guiana-based spaceport in the early 2020s. A Russian space editor, Andrei Borisov, has captured the fading zeitgeist of the Russian space program in a lengthy article on the new leader of Roscosmos, Dmitry Rogozin, and the changes he has proposed. "The 'Russian Space' Rogozin is trying to create reminds one of the Dark Ages in Europe," Borisov writes on Lenta.Ru, where he serves as editor of science and technology. "In it, there is no place for modernization, there is only the mission of survival." By Keith Cowing on July 8, 2018 5:57 PM. By Keith Cowing on July 3, 2018 11:19 AM. Keith's note: I got this note from Homer Hickam today: "While reading about the kids in Thailand trapped in a cave by floodwaters and the rescuers thinking about training them to scuba dive, it first occurred to me that we teach youngsters to dive very quickly at Space Camp's Underwater Astronaut Trainer (UAT) and might be able to help. But on second thought, we do this in ideal conditions with perfectly clear, warm water. These youngsters in Thailand would have to deal with cold, very murky, and rapidly moving water so I concluded teaching them to dive was impractical. Then I recalled that NASA developed Personal Rescue Enclosures (PRE) for shuttle rescues. Here's a mockup of the rescue ball as tested. In this case, the ball would be flooded, eliminating the buoyancy problem. Could be done and the kids could be fully controlled this way. Continue reading NASA's Rescue Expertise Is Needed Again - In Thailand. By Keith Cowing on July 3, 2018 10:07 AM. "Planetary protection policies are facing unprecedented challenges as NASA and other national and international space agencies move forward on missions such as Mars Sample Return and exploration campaigns to the icy moons of Jupiter and Saturn. NASA also does not currently have a planetary protection policy in place regarding human exploration to Mars, which could take place in the 2030s. Moreover, the current U.S. government process to oversee samples returned from Mars and elsewhere dates back to the Apollo era and is out of date. The committee recommended that NASA's agency-wide planetary protection strategic plan prepare for the policy development challenges that sample return and human missions to Mars are creating, as well as revise or replace its provisions for engaging relevant federal agencies in developing protection policies for returned samples." "[NASA PLanetary Protection Officer Lisa] Pratt's debut comes just as NASA's Office of Planetary Protection itself goes through a more profound transition. Back in July 2017 NASA announced the office was being transferred from the Science Mission Directorate to NASA's Office of Safety and Mission Assurance in Washington, D.C. That move, agency officials said, will inject more engineering rigor into the biological contamination control for outbound and inbound planetary spacecraft."